Mental strength coaching helps athletes and performers learn how to respond to adversity under pressure situations. Tom Brady, Michael Jordan, Roger Federer, and Maria Sharapova are just a few top athletes that have a high level of mental game strength when they compete. What does a mental strength coach do for athletes and teams? A mental strength coach helps athletes improve mental game skills and mental toughness so they can perform at their peak performance or improve consistency. One example of mental strength is how athletes respond to injury. Athletes respond to injury in various ways, but many experience overwhelming feelings of anger, fear and sadness. These athletes may also experience a great sense of loss if told they will be out for a long time. That feeling might be delayed or immediate depending the severity of injury. After talking with your doctor or surgeon, it’s common for those feelings to only become worse knowing that you have a long recovery ahead. For this reason, athletes must learn to separate the person from the athletic persona. A hallmark of great athletes is the ability to perform consistently well under pressure. When the game is on the line, these athletes do not allow the expectations from teammates, coaches, and fans to derail them. Mental strength helps performers thrive under competitive situations. Mentally tough athletes elevate their performance when the game is on the line. We call these athletes gamers. They don’t choke, fold, or get scared under pressure. And this is a learned skill through experience, mental game skills, and a positive sport environment. As athletes achieve greater success, expectations for performance also elevate. Having high expectations can hurt athletes’ confidence when they fail to reach them. Having high expectations means athletes feel more pressure to perform well. For example, expectations such as, “I must score 10 points every game” or “I shouldn’t make any mistakes,” cause athletes to worry about outcomes or results. Expectations are absolute needs or demands that athletes place on the quality of their performance or outcomes, such as, “My performance should look or feel perfect all the time.” These unwritten standards about how athletes think they SHOULD perform are often not rational. The problem is that these expectations cause athletes to constantly judge how well they’re performing or doing in a competition. Superior concentration is another characteristic of athletes with mental strength. Having a high level of concentration means that athletes have the ability to focus in the moment and on the correct performance cues that will help them perform. Likewise, good concentration also means coping with distractions. Focusing on the process means being present in the moment (the here and now), not the last play. To be in the zone, athletes focus in the moment, not the past or future. For example, when athletes dwell on a mistake, focus is split between the past and the next play. Also, thinking about future outcomes, such as, “I hope I don’t make a turnover” or “Don’t strike out” takes the focus away from the process during practice or competition. Self-confidence is how strongly you believe in your ability to execute any skill or task. Without a consistently high and stable level of confidence, you simply can’t perform at your best. High confidence improves athletes’ overall mental game strength. Confidence helps athletes let go of mistakes quicker, perform with less fear and stay calm and composed. Confidence develops over many years of practice and competition. It develops from past performance, success, training, preparation and mental toughness. Athletes gain confidence when they know they have the physical skills and talent to perform well in sport. Mental strength coaching helps athletes have stable confidence when they perform. For mental strength, two mindsets help athletes reach their full potential. These are: (1) The practice mindset and (2) the trust or performance mindset. The practice mindset helps you improve your skills for competition. In a practice mindset during training, you strive to get better and to improve your game. You practice today to play better tomorrow. Alternatively, the performance mindset comes from motor memory or what you have already repeated in practiced. Here, you perform freely and intuitively by relying on memory instead of giving yourself verbal commands, such as “plant my foot, keep toe down, extend my leg, keep head down, etc.” Mental strength coaching helps you trust in your skills. Your performance flows without thinking about “how to” to perform. It’s likely that you’ve been upset, frustrated, or angry with yourself after making mistakes. Part of mental game strength is having high composure and responding well after mishaps, mistakes, poor calls by officials, or any other challenge. When athletes dwell on mistakes, their mind is stuck in the past. This leads to feeling frustrated and then having a split focus. When you can let go of mistakes quickly, one mistake doesn’t turn into more mistakes. What does a composed athlete look like? What are the characteristics of composure? A mental strength coach helps athletes develop preshot and pre-play routines. Routines help athletes mentally and physically prepare for a self-paced sports skill, such as a free throw, golf shot, serve, or pitch. A routine helps athletes have a focused mindset to improve consistency in performance. Routines are ideal for helping athletes apply many of the mental strength strategies, such as focusing, confidence, and trusting skills. The physical part of a routine is easy for most athletes to implement. For example, a routine might include bouncing the ball as you set up for a serve or free throw. The mental parts of a routine are the most important. Athletes mental routine includes the decision-making, confidence building, focusing, and trusting skills, which are critical for a strong mental game strength. Both the physical and mental components of a routine work together. 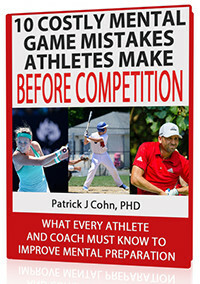 Mental strength coaching helps athletes improve consistency and take their practice game to competition successfully. Athletes who lack mental strength are more likely to choke or fold in competition. Mentally strong athletes possess many skills to help them be successful, such as managing competitive pressure, concentration, proactive confidence, trust in their skills, and the ability to stay composed after mistakes and mishaps.